In his second term, President Obama is speaking more openly about events as he wants, especially those concerning Black America. Black Lives Matter: Brazilian Police Kill Citizens 6 Times More Than U.S.
Last Monday, over 5,000 Brazilians took to the streets of Salvador da Bahia to protest the deaths of unarmed Black people by police officers. Salvador da Bahi, the center of Afro-Brazilian culture, is feeling many of the pains endured by Blacks in America as Brazilian police have killed an average of six people per day between 2009 and 2013. Much like the U.S., these victims are disproportionately Black. Over the past five years, Brazilian police have killed close to as many citizens as U.S. police have in the past 30 years. Last week’s protest is part of a larger movement in Brazil, “Reaja ou SeráMorto,” which translates to “React or Die,” and has many of the same concerns as America’s Black Lives Matter movement. The New York Times reported at least 2,212 Brazilians were killed by the police in 2013. This number could be greater, but unfortunately not all states within the country record just how many deaths occur at the hands of police. “Of course, the sense of outrage would be different if these victims were boys with blond hair and blue eyes who lived in rich areas, but they were not,” Antônio Carlos Costa told the Times after a 10-year-old was killed by police and his mother threatened at gunpoint. Costa is a Presbyterian pastor and works to keep track of how many children under 14 are killed by the police. One human rights attorney who volunteers with the movement said Brazil has it far worse than America and the numbers attest to this. The Reaja ou Será Morto movement has existed for the past 10 years, but only recently have they taken to the streets to create large protests. 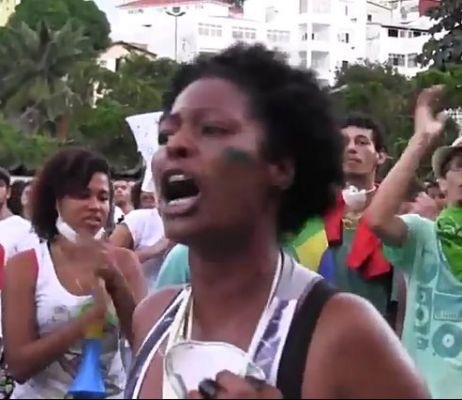 “When the police invade your community, your home, bash in your door, and slaughter a young family member before your eyes, it sets terror and a river of tears, and endless pain, a pain that lives after the dead are buried… We are calling this a genocide,” said one 24-year-old Afro-Brazilian woman at Monday’s protest. Blacks in Brazil are no longer keeping quiet as police terrorize their communities, even in the face of possible death. A protest of last week’s magnitude isn’t widespread in Brazil due to the fact police often threaten the lives of organizers. Reaja ou Será Morto organizers have received death threats on their phones and social media pages and even unwarranted home visits from police. But Reaja ou Será Morto is saying the time is now for justice in their country. “We are not celebrating the dead; people are here celebrating life. The life of our children, to guarantee they will wake up every day and not worry about dying,” another protestor contended. Donald Trump Doesn’t Correct Anti-Muslim Supporter Asking For Plan To “Get Rid” Of Muslims In U.S.
At a campaign rally Thursday, a supporter stated the president wasn’t American, then went on to ask Trump how to “get rid” of Muslims. This case brings me a level of trust in the Department of Justice, while at the same time, causes me to question their impartiality. In March 2015, a federal grand jury returned a four-count indictment against former Independence, Missouri, police officer Timothy Runnels for violating the constitutional rights of a minor who was in his custody and obstructing the subsequent investigation into the incident.